Here’s a live look at the junction of US20/I-39 with I-90 in Cherry Valley. Winter Storm Warnings were issued for the majority of northern Illinois early this morning while Winter Storm Watches remain for Rock and Walworth Counties and a Winter Weather Advisory for Stephenson, Jo Daviess, and Carroll Counties in Northwest Illinois starting tonight and lasting through midday Friday. An area of low pressure is expected to develop and move through the Mississippi Valley late this afternoon and evening. As it does, copious amounts of moisture in the low levels of the atmosphere will accompany it allowing for snow showers to develop late this evening and overnight. There are a couple things to watch very closely as this storm continues to develop and move northeast. The track is still a little uncertain, even a day away, but computer models are still putting northern Illinois in the zone for some heavy snow amounts. Two: there is a little dry and warm air in the upper levels of the atmosphere. So as snow does begin, we could actually see a snow/sleet mix early in the evening before colder air filters into this storm and the air begins to moisten up. 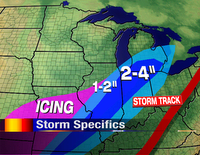 If we see a mix of sleet and snow initally, then snowfall amounts will be reduced a little througout the Stateline. As the system continues to track south of Chicago, more than likely heavier bands of snow will develop across the region which could produce amounts of 10″ or more! Winds will also be very gusty from the northeast tonight so that could cause blowing and drifting snow along roads and sidewalks. Bottom line, as heavier amounts of snow begin to fall roads could become slick through early morning. So if you have to travel, please use extreme caution. Eric and I will be here keeping a very close eye on the storm as it develops and moves in. 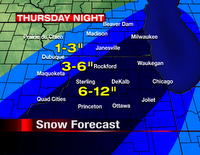 The evening models are in and the consensus is not good for North-Central Illinois and southeastern Wisconsin. Heavy snow will affect the area beginning at 7pm Thursday and ending at 9am Friday. Snowfall totals will be highest 30 miles east and west of DeKalb where 6-12 inches is possible. 3-6 inches of snow is possible from Freeport to Galena. 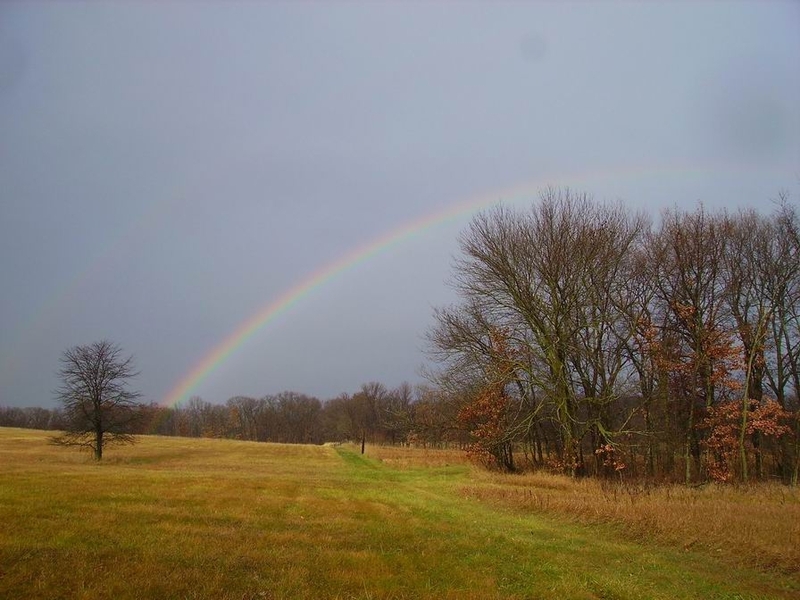 Locally higher amounts will be possible as the liquid precip will average around one inch. We’ve got two things to watch during the next 36 hours. 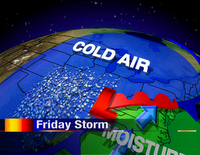 First, the potential for some freezing rain, sleet, and snow tonight. Late tonight there could be some slick spots, but roadways will remain at or above freezing (except if there are areas of heavy sleet). Since sleet pellets are very dense, they can accumulate easier on warm roadways. This could pose a problem after 9pm. 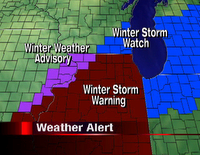 Use caution as Winter Weather Advisories are in effect for areas west of Rockford tonight. As the very dynamic storm system continues to take shape in the southwest, Weather Advisories are already being issued for parts of Illinois, Iowa, and Missouri for tonight and tomorrow. As a cold front continues to move through Northern Illinois this morning, temperatures will fall throughout the day. But not before rain and even a couple rumbles of thunder move through. As lows tonight fall below freezing, rain will likely change over to freezing rain; starting in Iowa and moving east into Illinois. 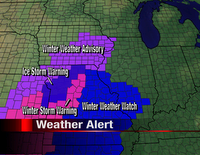 Already Winter Weather Advisories have been issued for parts of Iowa and Jo Daviess County in Northwest Illinois. Roads could be slick on Thursday. As temperatures struggle to make it out of the 30s for Thursday, snow and sleet will be likely early and then snow showers for the afternoon. With the latest run of computer models last night, I’m not 100% convinced that we won’t see any snow on Friday. While it looks like the major accumulations will remain south and east (things could get very interesting for Chicago and Indiana) we may end up with a couple of inches, with some areas receiving heavier amounts . 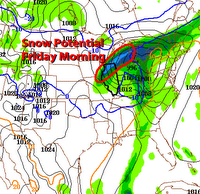 However, the further west you go the chances of seeing snow will become less likely. The one very interesting thing with this system is that before anyone sees any winter precipitation, parts of Missouri and southern Illinois have the potential for some strong thunderstorms later today! Talk about a weather roller coaster ride! If you have any travel plans be sure to check back for the latest weather updates! The Weather Channel comes to WREX! Jorma Duran from The Weather Channel visited the WREX-TV studios this afternoon! With cameras rolling, we talked about how this upcoming winter storm will affect Rockfordians. He will be reporting live from downtown Rockford tonight (Wednesday). The first updates will be on “Abrams & Bettes” from 7-8pm, and through the evening on “Evening Edition” from 8-11pm. It will be a treat to bring our Rockford perspective to the rest of the country tonight! Jorma said they will likely report from Chicago tomorrow, unless the bullseye of the storm is expected to be here in Rockford. 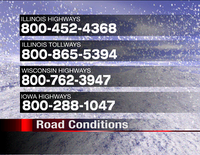 The Weather Channel is on Rockford Insight Cable channel 13. This morning’s computer models have abruptly changed the course of our next storm. Instead of a classic snowmaking track for us (Memphis to Detroit) the system looks to follow a line from Nashville to Syracuse. That’s way too far away to spin back the needed moisture for a decent snowfall here. Still, parts of Illinois will get hit by this system. First, Winter Storm Watches are out for much of Missouri for the threat of freezing rain Wednesday night into Thursday. Secondly, I wouldn’t be surprised if there’s a stripe of 2-4″ snow from St. Louis to Champaign to Ft. Wayne through the day on Friday. Unless the models change the course of this system (back to the location they were on Monday) we’ve got little/no accumulation on the horizon. There still could be some grassy areas that are covered up early Thursday morning in the Rockford area, but anything substantial will remain about 120 miles to the southeast. Meteorology is a lot like gambling, you never want to place all your money on one bet. Because chances are, you’ll probably lose. Yesterday a couple of the computer models were hinting at the possibilty of a significant snow event for much of the northern Illinois region. And before I put any red flags up, today is a different story. That’s what makes forecasting so much fun! There is no doubt in my mind that the cold front that is forecast to come through late on Wednesday will bring us a chance for rain and even the potential for freezing rain during the overnight as temperatures fall into the 30s after seeing highs in the upper 50s and lower 60s. Along the front however, a couple of the computer models were indicating that another storm system would move in from the southern Plains, through central Illinois and into southern Michigan. 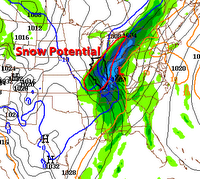 With that track, northern Illinois would be right in the middle of an accumulating snow event. However, today the computer models are taking that storm system and moving it further to the east, which would take the heavy snow potential with it into the Ohio River Valley. That is why it is very important, especially this time of the year, to pay very close attention to the track of these storm systems. Because even as much as a 50 mile deviation to the east or west could mean a big difference across the Stateline.